Healthy, light and full of flavor! Broadway Burger Bar & Grill located inside the Village Streets is not only the best tasting burger, but is one of the healthiest burgers you will ever try! Our burgers come straight from the Estancia Farm in Uruguay and are 100% Free-range, grass fed, Estancia beef. 8 oz. grass fed, free range Estancia beef. Healthy, light and full of flavor! Tender, alderwood smoked chicken breast marinated in fresh garlic, herbs and olive oil. *Thoroughly cooking foods of animal origin such as beef, eggs, fish, lamb, pork, poultry, or shellfish reduces the risk of foodborne illness. Individuals with certain health conditions may be at higher risk if these foods are consumed raw or undercooked. Please let your server know if you have any allergies as not all ingredients are listed on the menu. 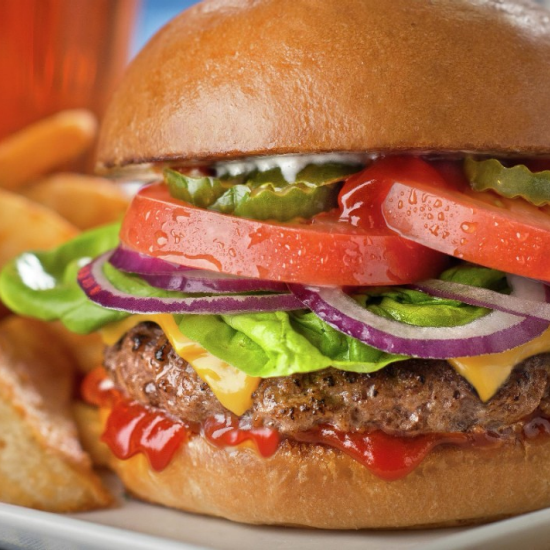 *All burgers are served with lettuce, tomato and choice of American, cheddar or Pepper Jack cheese. All Natural. Hormone Free. Grass fed, free range Estancia beef. Healthy, light and full of flavor! All burgers served without a bun. Additional for gluten free bun. Add beef patty, salmon patty, or grilled chicken breast to any salad for an additional charge. Straight outta Brooklyn New York! Locals receive 10% off your bill at Broadway Burger Bar*! Take the parking garage hallway to the escalator towards the Casino. Head right towards the Front Desk and take a left. Walk straight passing the Front Desk towards the Century Elevators. Continue straight passing Il Fornaio on your right, and then head right at the end of Il Fornaio’s patio towards Gallagher’s Steakhouse. Continue through Village Street Eateries and make a left at Greenwich Village Coffee. Continue straight towards the Zumanity Box Office, Broadway Burger Bar will be on your right. Take the parking garage hallway towards the Big Apple Coaster and Arcade. Pass Nathans on your left and take the escalator on the left down to the Casino Level. Make a U-turn towards the left right off the escalator. Heading straight, passing Il Fornaio on your right, and then head right at the end of Il Fornaio’s patio towards Gallagher’s Steakhouse. Continue through Village Street Eateries and make a left at Greenwich Village Coffee. Continue straight towards the Zumanity Box Office, Broadway Burger Bar will be on your right. If you are facing the Front Desk, go right towards the Century Elevators. Continue towards the escalators. Continue heading straight, passing Il Fornaio on your right, and then head right at the end of Il Fornaio’s patio towards Gallagher’s Steakhouse. Continue through Village Street Eateries and make a left at Greenwich Village Coffee. Continue straight towards the Zumanity Box Office, Broadway Burger Bar will be on your right.